What’s Happening at Pakistan’s Gwadar Port? Despite big promises, the China-Pakistan Economic Corridor is yet to deliver local benefits. A stray dog snoozes under a red boat lying next to a rickety tea shop on the quay at Sur Bandar, where a few dozen small boats are bobbing in the Arabian Sea. The water is clear and a school of fish is swimming near the shore. The fishermen gather and chat over cups of a strong, sweet concoction they call “doodh-patti” as they watch the world go by. I ask some if they have heard of the much-touted China Pakistan Economic Corridor (CPEC), but they shake their heads. The harbor front is quiet compared to the one at Gwadar, some 20 kilometers away, where a Chinese deep sea port is under construction, promising to transform the sleepy town into a global trading hub. CPEC is a 3,000-kilometer corridor from Kashgar in western China to Gwadar in Pakistan on the Arabian sea. 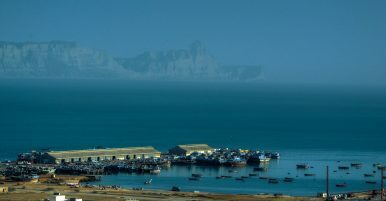 It slices through the Himalayas, disputed territories, plains, and deserts to reach the ancient fishing port of Gwadar. Huge Chinese funded infrastructure projects, including road and railway networks as well as power plants, are being built along the way. Originally valued at $46 billion, the corridor is estimated at $62 billion today. CPEC is part of China’s Belt and Road Initiative (BRI), a massive regional trade and diplomatic venture that covers both land and maritime routes linking China to the rest of Asia and to Europe. The port under construction at Gwadar is owned by the Pakistan government’s Gwadar Port Authority (GPA) and operated by state-run Chinese firm China Overseas Port Holding Company (COPHC), which will run it for 40 years. For China, Gwadar is strategically perched near the Arabian or Persian Gulf and close to the Strait of Hormuz, through which an estimated 40 percent of the world’s oil passes. Gwadar is a gateway to the oil rich Middle East, and central and South Asia. Elsewhere in Pakistan, not a day passes without someone from the ruling Pakistan Muslim League-Nawaz making a reference to CPEC or how it will bring prosperity to the length and breadth of Pakistan, and in particular to Gwadar. Yet the voices of fishermen in Gwadar – who make up 80 percent of the district’s 185,000 inhabitants – have been largely ignored. A recent report showcasing Chinese plans for CPEC, published by the newspaper Dawn, appears to validate the notion that locals are not contributing to the development of CPEC. In Sur Bandar, rumours are rife that there will be an influx of fisherman who’ve been displaced by the Gwadar project. Saeed Mohammad, president of the Anjuman Itehad Mahigiran Sur Bandar (the Sur Bandar fishermen organization), says he has heard from “those in the know” that it will happen but does not know when. “There is not enough space for their boats to berth here, it’s not even enough for us,” he exclaims, gesturing to the docking area. There are about 5,000-7,000 fishermen with 1,000 or so boats in Sur Bandar, he says, while the number in Gwadar is about three times that. The Gwadar Development Authority is constructing a jetty at Sur Bandar, which the residents suspect will eventually accommodate the fishermen from Gwadar. The fishermen say the jetty’s breakwaters have been badly designed and that engineers failed to consult them in the process. The fishermen in Gwadar are also concerned that they will have to relocate to Sur Bandar. Gwadar, he explains, is naturally protected by a hammerhead-shaped peninsula, which forms two almost perfect semi-circular bays on either side. In 2007, during the first phase of the construction of the port, about a hundred families living in a century-old settlement known as Mullah Band were relocated. They were promised alternative land to build homes, plots in a housing project, and cash. “I wouldn’t say we were not compensated, but some of our property has been grabbed by the land mafia,” says former fisherman Saleh Mohammad, who now works in the cement business. In addition, they were promised a hospital, a school and proper roads. Ten years later, the new Mullah Band still has none of these basic services. The only school is far away and the teacher seldom turns up. Not that the situation in Gwadar is much better, although they have heard many promises in the last 12 years. On his visit to Gwadar earlier this year, Pakistan’s Prime Minister Nawaz Sharif said 1,100 kilometers of road would be built within the city. “When roads are made, success follows; schools are built, colleges are built, hospitals are built… industries are established and progress and prosperity flourish,” he said. Currently the town, which is situated in one of Pakistan’s poorest provinces, Balochistan, lacks even basic services. A local journalist, Behram Baloch, says healthcare is rudimentary and for women it is almost non-existent. For childbirth complications they must travel to Turbat or even Karachi, nearly 500 kilometers away. Vocational Training – Will Locals Benefit? The Chinese company says the fishermen’s livelihoods will not be affected and that once the port factories are set up there will be no shortage of work. “They will all be absorbed in activities related to their own occupation be it fish processing, or value addition,” says Dadullah Yousaf, a local working with the COPHC as deputy manager in planning and development. But the fishermen do not feel reassured. Despite new jobs opening up for skilled workers in Gwadar, locals with fewer skills and no education fear that they will be left behind. “We do not know anything other than fishing” is a refrain you hear wherever you go. But local teacher and poet Mr. Firaq disagrees. He says new livelihoods for local people and vocational training are needed in case their occupations are lost. However, the port authorities are planning for skills development in the second phase of construction with plans for a vocational training institute in Gwadar. “Until the institute is set up, the GPA will hold classes in the old building of the Gwadar Degree College. There are 17 classrooms there which we plan to renovate and within two months begin the courses in motor winding, crane and fork-lifter maintenance, welding and Chinese language,” he said. But even if the locals acquire those skills, they may find it difficult to earn as much as they do now. In a week, the fishermen can make from 20,000-50,000 Pakistani rupees ($188-471). The wages of an unskilled worker at the port are not more than 20,000 rupees a month, and those of skilled labor, somewhere between 28,000-50,000 rupees ($264-471) a month. For the nearly 800 strong Chinese and Pakistani workforce, the port and free trade zone is a forlorn place. The area is cordoned off by about 300 men from the Pakistan Navy stationed inside the port, says Dadullah Yousaf. When I visit, there are no ships berthing or trucks loading and unloading. Shabbir Ahmed, the private secretary to the chairman of the Gwadar Port Authority, assures me that the “ships come and go” and I just happened to have come on an unusually quiet day. He is among the oldest hands at the port, having been employed there since 2004. Since the first ship berthed in March 2008, around 200 ships have arrived, bringing anything from wheat to fertilizer, dates to camels. “So far, we have only shipped out containers of sardines from Pakistan,” says Yousaf. In its first phase, the port was developed jointly by the governments of Pakistan and China at a cost of 17 billion rupees ($288 million) and inaugurated in March 2007. Control of the port was then handed over to the Port of Singapore Authority (PSA) under a concession agreement for 40 years. However, PSA was unable to expand or bring business to the port and concessional rights were transferred back to the COPHC in 2013. At any given time, the port can berth two or three large ships with capacity of 50,000 DWT (dead weight tonnage). By 2045, the port will be able to berth 150 ships and cargo up to 400 million tonnes, and will have multiple logistics services, a huge storage facility and a nine-square kilometre industrial free trade zone (GPFZ). Phase one of the GPFZ will be ready by early 2018 – and will include a pipe plant, a cold storage and fish processing area, an e-bike factory, and display centers for Chinese goods. The entire zone will be fully operational in seven to eight years and house over 400 companies and Pakistani-Chinese joint ventures. Inside the port, one can be forgiven for thinking there is an endless supply of electricity, gas, and water. The port generates its own electricity and desalinates water. But these luxuries are only available at the port or in the town’s only five-star hotel. The rest of the town must contend with long power outages. Despite being surrounded by deep sea, water is a precious commodity in Gwadar – a desert town suffering from chronic drinking water shortages. Once the port activities expand and the GPFZ develops, it will need much more water and electricity. To meet these needs, the government wants to build two coal-fired power plants of 150 megawatts each at Karwat, about 40 kilometres from Gwadar, at a cost of 55 billion rupees ($520 million). Dadullah Yousaf insists the GPFZ will not use any electricity that is produced from coal. “I assure you; we’ve just signed an environmental agreement with investors stating we will not use dirty fuel there,” he says. The government is drawing up a 2050 plan for Gwadar to take care of all the water woes including its water supply, distribution, and sewerage collection and treatment plants at an estimated cost of $130 million. Meanwhile, the townspeople are clamoring for potable water now. The nearby Ankara Kaur dam does not fulfil local needs. The city requires 4.6 million gallons of water per day but is expected to need 12 million by 2020. New dams are in the pipeline and a planned desalination plant may provide clean water to the local people. However, there is little to see on the ground. Locals say they have faced an ongoing water crisis for the past five to six years. The government periodically must take emergency measures to provide water from the Mirani and Belar dams through tanker deliveries. There are over 300 Chinese people working as both unskilled workers and skilled engineers and in senior management positions living inside the port. For security reasons, they all live in a community that was built in just two months. A home away from home, it looks spartan, but has a gymnasium, a table tennis and snooker room, a karaoke room, and even a mini astro-turf football field. They work for six months and get three weeks off to go back to China. He has found a new hobby – fishing – although that is restricted, too, as he can only fish at the port and just inside the channel under the constant gaze of the marine security agency. When he does go out to the city, it is always in a group and surrounded by security people. Locals always want to take his photograph. “Even then the security people are very strict, but I often tell them it’s okay to let people take selfies with us,” he says. “It will all be worthwhile then,” he says, before leaving to make a presentation for the Chinese ambassador. Zofeen T Ebrahim is a freelance journalist based in Pakistan. Gwadar: Emerging Port City or Chinese Colony?National Ambitions Meet Local Opposition Along the China-Pakistan Economic CorridorAfghanistan: Prospects and Challenges to Regional ConnectivityWhy Saudi Arabia Joining CPEC MattersWhy Is China Vulnerable to Terrorism in Pakistan?